Two biomineralization proteins, with acidic amino acids in red and calcium ions in blue. You might be surprised to hear that tooth enamel, the strongest material in our body, and eggshells, which must be fragile enough for baby birds to hatch, are both roughly 95% composed of mineral crystals. The different characteristics of these two biominerals are a consequence of the proteins that build these tiny crystals and the proteins that glue them together. Biomineralization proteins help construct cellular compartments that host growing minerals, transport ions into the compartments, nucleate growth of new crystals, and control the ratio of ions as the crystals grow. Proteins can even stabilize unusual crystal forms that would otherwise be unstable. Osteocalcin, shown here from PDB entry 1q8h, is the second most abundant protein in our bones (after collagen) and also acts as a hormone to promote bone growth. In bones, it binds to the surface of hydroxyapatite crystals, a mineral composed of calcium and phosphate. The structure reveals how this protein recognizes the inorganic mineral surface: it has a cluster of negatively-charged amino acids spaced at the right distance to recognize the calcium ions in the mineral crystal. Several calcium ions were seen in the crystal structure, showing this perfectly-matched spacing of amino acids to ions. Eggshells contain calcite, a mineral form of calcium carbonate, with a matrix of protein sandwiched in between. 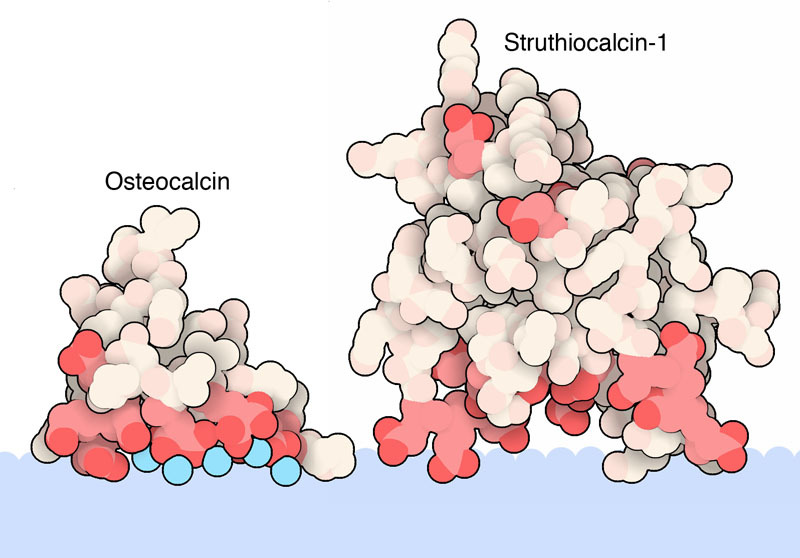 Like osteocalcin, eggshell protein struthiocalcin (shown here from PDB entry 4uww) binds to the surface of the mineral crystals using an array of acidic amino acids that bind calcium, helping to direct crystal growth during the formation of the eggshell. Studies of ostrich egg fossils show that this interaction is so strong that fragments of the protein-mineral complex can last for millions of years. 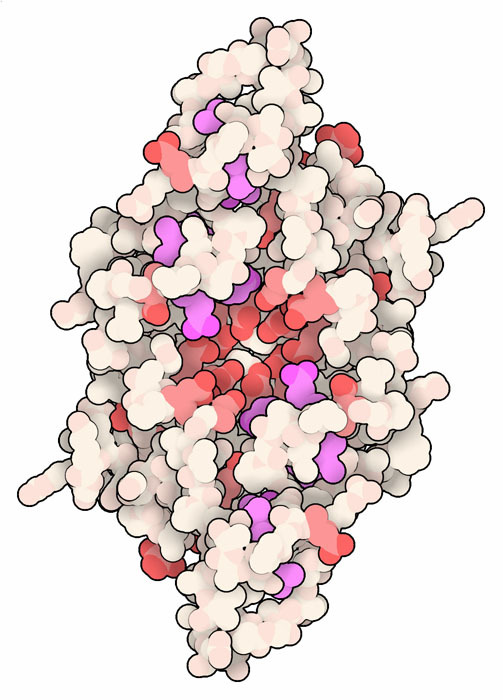 The folding pattern of struthiocalcin (termed C-type lectin) is similar to antifreeze proteins that bind to the surface of ice crystals (see, for example, PDB entry 2zib), and is thought to have evolved from a common ancestor. Based on insights from natural biomineralization proteins, scientists are designing short peptides to drive mineral synthesis in the laboratory. These peptides consist of a simple alpha helix or a beta strand with a repeated sequence of acidic amino acids, resembling the struthiocalcin mineral-binding surface. Researchers have successfully engineered peptides that can form vaterite, a calcium carbonate mineral form that is different than the calcite found in eggshell. Magnetochrome (MamP) with acidic amino acids in red and hemes in magenta. Amazingly, bacteria, birds and other organisms grow tiny crystals of magnetite that can act as compass to sense the Earth’s magnetic field. Birds need this to guide their continent-spanning migrations, and anaerobic bacteria use it at a much more local level: away from the equator, the magnetic field points towards the poles and also downwards, so these bacteria use it to guide them down, away from oxygen at the surface of their local environment. 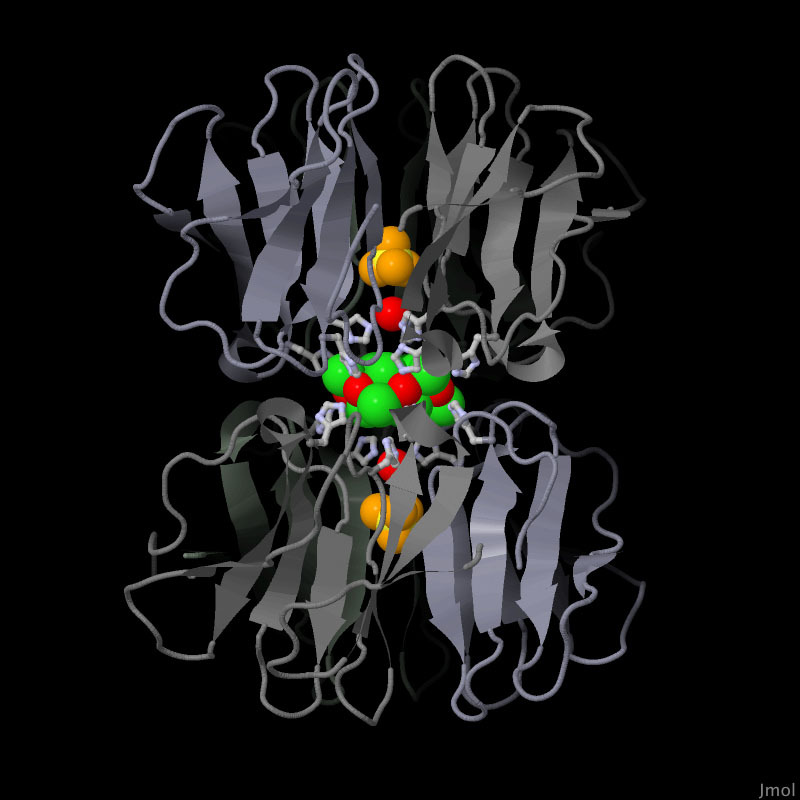 Magnetochrome or MamP, shown here from the PDB entry 4jj0, builds perfect crystals of iron oxide. MamP is a modular protein composed of a central domain linked to two consecutive magnetochrome domains. The central domain brings together acidic glutamate amino acids to form a pocket where iron nucleation is initiated. The hemes in magnetochrome domains, which are similar to cytochrome c, shuttle electrons to switch the oxidation state of the iron atoms as they are combined with oxygen in the growing magnetite crystal. Scientists are mimicking the process of biomineralization as a strategy to produce precise nanocrystals, for use in engineered materials with tailored magnetic, optical, and medical properties. For example, the designed protein nvPizza2-S16H58 (PDB entry 5chb ) sandwiches the smallest known nanocrystal, a precise 3D lattice consisting of 7 cadmium ions and 12 chloride ions. In the designed protein, the cadmium-chloride nanocrystal is coordinated by a set of symmetrically-positioned histidines extending inward from the propeller-shaped protein complex. Several other proteins assist with the formation of magnetite crystals. Try searching for “Magnetite” in the main RCSB PDB site to see them. You can use the Structure Alignment View to compare the similar structures of struthiocalcin and antifreeze proteins.